Looking out for your interests since 1984. Way, way back in the bad old days of the Core Set, tagging served essentially one purpose: Scorched Earth. The logic there was simple. If you can cause the runner to float one tag, just one, while you have a Scorch in hand, you can win the game. And so strategies emerged, which focused on getting the runner to have that one tag. Snare! would force them to decide between drawing up, or clearing the tag. SEA Source meant that, with an economic advantage, you could one-two punch your way to victory. Runners learned this, of course. They figured out that every turn they floated tags was a turn they risked annihilation. So, they cleared tags. And because most corps were only able to stick one tag at a time, this meant that runners came in two states: tag-free, and dead. Midseason Replacements, released in the first cycle, shook this up a bit. Now, there was a way to absolutely smother the runner in tags, all at once. This, incidentally, made Psychographics a secondary option to exploit tags, especially alongside Project Beale (which was released in the same pack as Midseasons). So, now runners could come in three states: tag-free, dead by Scorched Earth, or buried in tags and rapidly losing the game. But again, runners adapted. Since they might not be able to clear the tags off to dodge the Scorch, they started using Plascrete Carapace and later I've Had Worse to eke out a few more turns of life. They built stronger economies, or used Vamp, to keep the corp just far enough behind to make Midseasons unviable. And then the corps pushed back again; Traffic Accident and Punitive Counterstrike could burn through protection, and decks like When the Flash Wears Yellow made economy their goal. But, fundamentally, it was the same tagging dynamic. Corp decks were looking to either stick just one tag, or to pull Midseason Replacements and overload the runner. And in that meta, Big Brother was a terrible card. It couldn't help you enable Scorch, and once you pulled off a Midseason Replacements saying "take two more" way supremely underwhelming. The times they are a-changing, though. 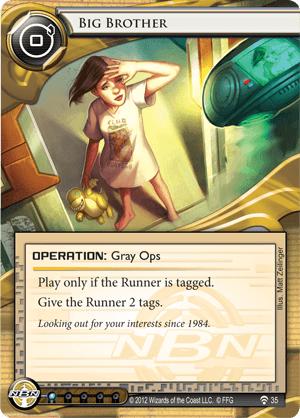 As more NBN cards were released over the Lunar and SanSan cycles, and with the spoiled Data and Destiny coming swiftly up, we are going to see a shift towards a third kind of deck; the tags-as-tax deck. These decks will not try to Scorched Earth or PsychoBeale. Instead, they will simply pressure the runner with a steady flow of tagging cards: News Team, Casting Call, TGTBT, Bernice Mai, and many new pieces of tracer ICE. At the cost of one and 2 (or 3, with one side of SYNC) each, the runner might find themselves going bankrupt, backsliding every time they try to do something productive. And it's just so, so easy to give in and stop clearing them off...and that's when they spring the traps. Closed Accounts. Pachinko. Information Overload. The All-Seeing I. Shoot the Moon. Quantum Predictive Model. The other side of SYNC. And many more. None of these cards ends the game outright...but damn, do they make the runner's life hard. It is in this deck archetype that I believe Big Brother will find its niche. Runners will typically clear one tag...but three? Especially against SYNC, that's a huge tempo loss. And as soon as they give up, they're looking at all the nastiness NBN can throw at them.